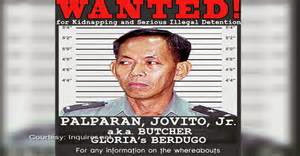 THE PEOPLE NOW ARE REJOICING ON GEN. PALPARAN ARREST BY THE COMBINED FORCES OF NBI AND AFP. THE AT LARGE SALVAGERS ARE NOW ARRESTED AND THE PEOPLE ARE SAFE WITH HIS EVILNESS. 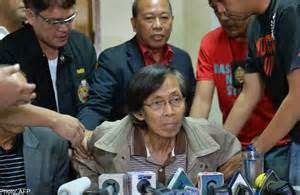 AT LAST THE ACCUSED KILLER "BERDUGO" OF GMA OR GLORILA ARROYO AND KILLER OF UP STUDENT AND MANY MORE ACTIVIST AND PEOPLE WAS NOW IN THE HAND OF LAW TO PROSECUTE AND PAY HIS LIFE DEBT TO PEOPLE. THIS EVENTS IS ONE OF THE MOST GOOD THINGS DID BY THE GOVERNMENT IN PRESIDENT AQUINO REGIME IN HIS TUWID NA DAAN IN GOOD GOVERNANCE. 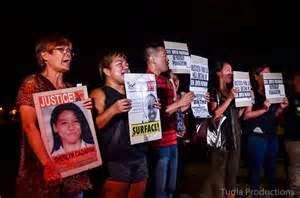 THOSE VICTIMS OF HIS EXTRA JUDICIAL KILLINGS. THE GOOD PREVAIL AND NOW THE EVIL DOERS PROOVEN WILL PAY HIS EVILNESS. THE GOVERNMENT DID THE BEST AND RIGHT IN FINDING AND ARRESTING THIS ABUSIVE GENERAL. IN FAIRNESS TO HIM AND EQUAL JUSTICE SERVE THE LAW IN EQUAL JUSTICE FOR ALL, GIVE HIS RIGHTS AND NEVER FOLLOW HIS FOOTSTEP OF BEING ABUSIVE TO A PERSON SPECIALLY TO INNOCENT PERSON. SALVAGING IS NOT THE RIGHT REMEDY IN SUPPRESSING CRIMES AND SPECIALLY THE VICTIMS IS INNOCENT, ABIDE THE RULES OF LAW OR DUE PROCESS AND GIVE RIGHTS OF THE PERSON TO MAKE SURE THE RIGHT THING AND IT IS A MUST AS LEGAL PROCESS. WE HOPE FROM THIS GENERAL ALL ABUSIVE IN THE GOVERNMENT WOULD BE PAY THEIR ABUSIVENESS, IT IS NOT ASHAMEFUL TO JAIL THEM BUT BE PROUD IF THE GOVERNMENT ARE STRICT IN GOOD GOVERNMENT. IT IS MORE ASHAMEFUL THE SALVAGE ARE SCATTERED IN THIS NATION AND PEOPLE ARE OPPRESSING THEIR RIGHTS AND LIFE BY THE GOVERNMENT INSTEAD OF PROTECTING THEM OR PRACTICE EQUAL JUSTICE. 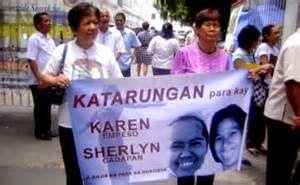 THE STRICT JUSTICE AND EQUAL JUSTICE IN THE PHILIPPINES FROM POLICING TO COURT CONVICTING CRIMINALS OFFENDERS SHOULD BE EMPOWER BY THIS NATION SO THAT EVERY CRIMINALS WILL BE PUNISHED AND CONVICTED AND THERE IS NO EXTRA JUDICIAL PROCESS TO EXECUTE.